Three summers ago one of the coolest businesses popped up in my neighborhood. The name "The Grease Diner" and the look of the shop quickly gained my curiosity. 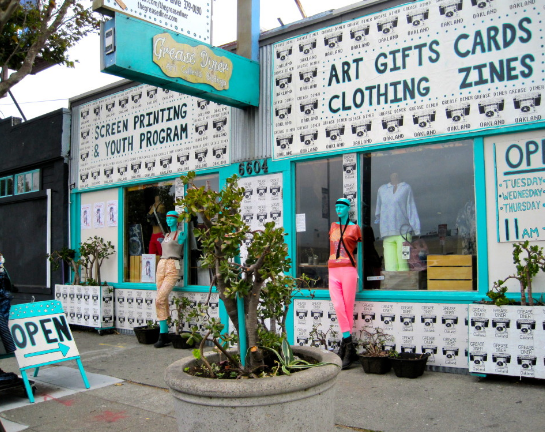 Before I knew it I was in there looking at their items and screen printing t-shirts. 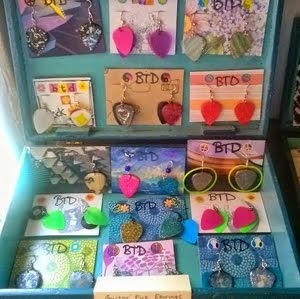 I ended up screen printing many Bite The Dust t-shirts and eventually selling my jewelry in their shop. Their store features unique items made by local artists and provides a great youth screen printing program. On January 19th 2014 I had a BTD anniversary party to celebrate 11 years. 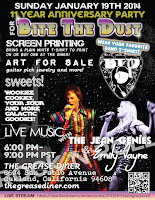 I lined up some live music and goodies, the nice folks of Grease Diner did the screen printing for my guests. 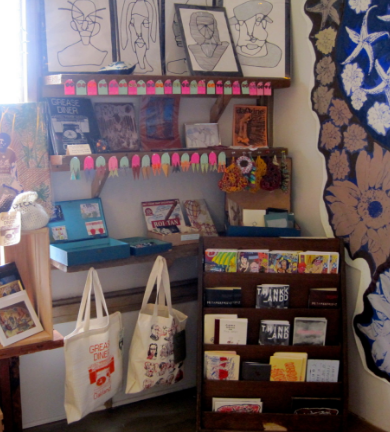 Jon Jon and Laurie have a great shop that adds culture and personality to the neighborhood and community. Their online shop has only local handmade items, many made on the premises. With the reoccurring theme of reusing and reducing, the Grease Diner using only organic cotton and other sustainable products. You can find Rock Resurrection Art's guitar pick earrings at the front right side of the store.